The waterways of Pennsylvania have played and continue to play a major role in the industrialization of our area. Our streams and rivers are valuable for transportation, sources of drinking water, recreational activities, wildlife habitat, and are necessary parts of the ecosystem. Unfortunately, many of the waters in Clearfield County are impacted by abandoned mine drainage, sedimentation, excess nutrients, and trash. But there is hope, these streams can be cleaned up! The Watershed Specialist at the Conservation District has been working to restore and protect the streams of Clearfield County since 2000. Some of the projects we have been working on include the design and construction of passive treatment systems for abandoned mine drainage, installation of stream bank stabilization and in-stream habitat devices, conducting watershed assessments and developing restoration plans, and working with the watershed groups throughout the county. Continue reading for more information about the watersheds in Clearfield County or contact Watershed Specialist, Kelly Williams at 814-765-2629. You can also check out our Clearfield County Waters website for more information on abandoned mine drainage in our county. No matter where you live, you live in a watershed. 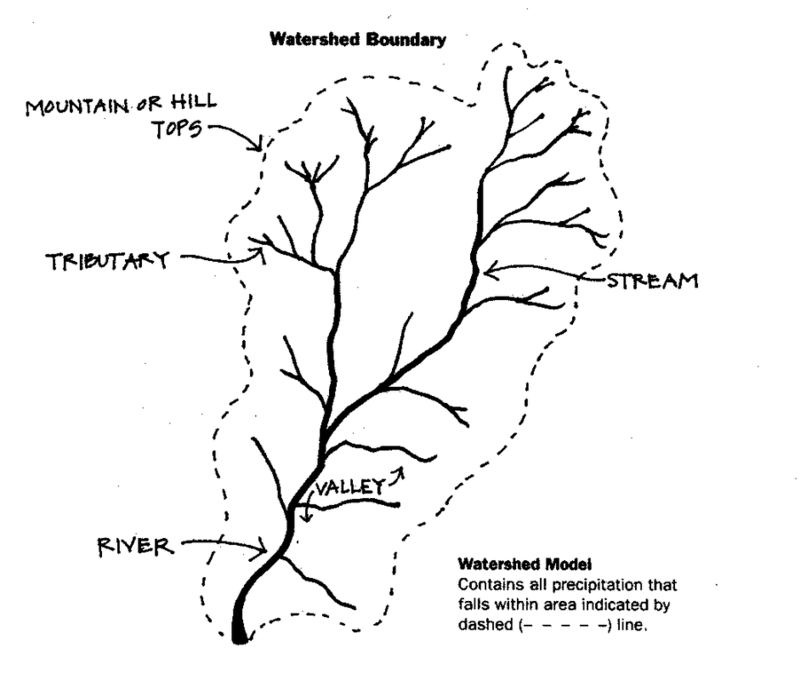 A watershed is the land area that drains to a sin­gle body of water such as a stream, lake, wetland, or estuary. These land areas are separated by ridges or hills. Watersheds are many different sizes.For example pretend you are a drop of rain.You fall on a hillside that overlooks Montgomery Creek.You will eventually flow into that stream; therefore you fell into the Montgomery Creek Watershed.You then flow into the West Branch Susquehanna River.Therefore, Montgomery Creek is a small watershed in the West Branch Susquehanna River Watershed.Then the river flows into the Susquehanna River then to the Chesapeake Bay.Therefore Montgomery Creek is one of many small watersheds inside the Chesapeake Bay Watershed.